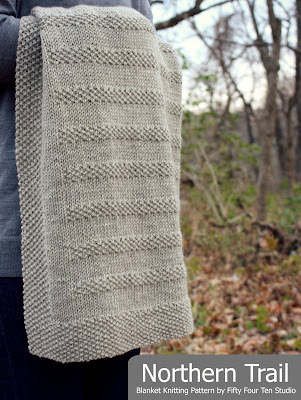 I'm so happy to introduce my new blanket knitting pattern - Happy Endings. Happy Endings blanket knitting pattern is very easy to knit with bulky weight yarn. 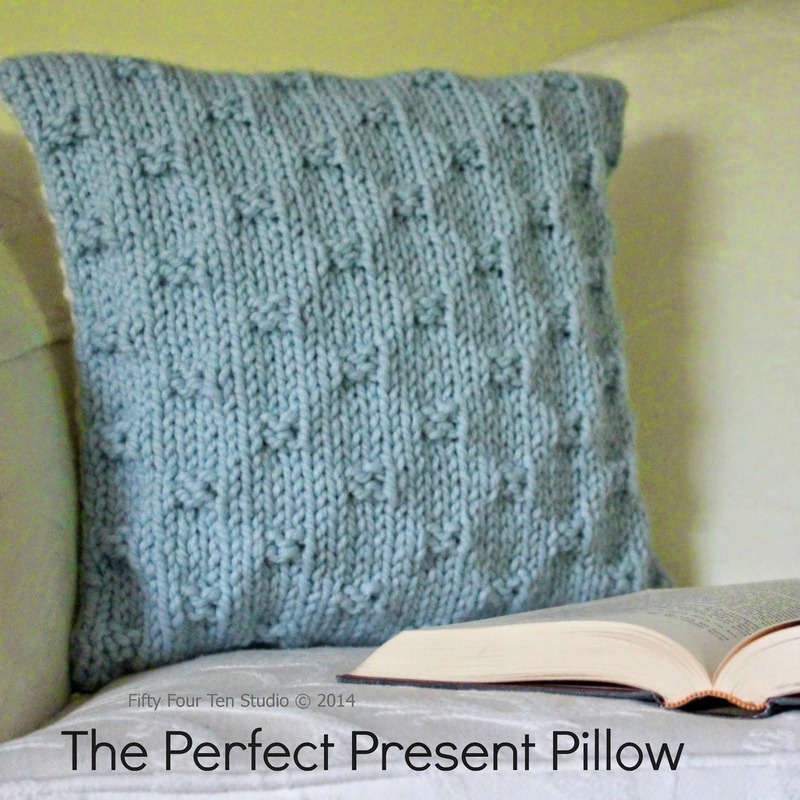 This is a great project for a confident beginner...or an experienced knitter who enjoys a relaxing, easy project. And, this blanket is reversible! 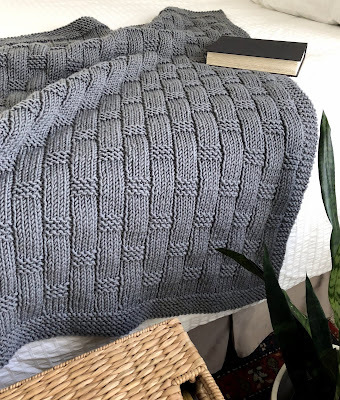 An easy to remember two-row stitch pattern creates a texture that is attractive on both sides of the blanket. 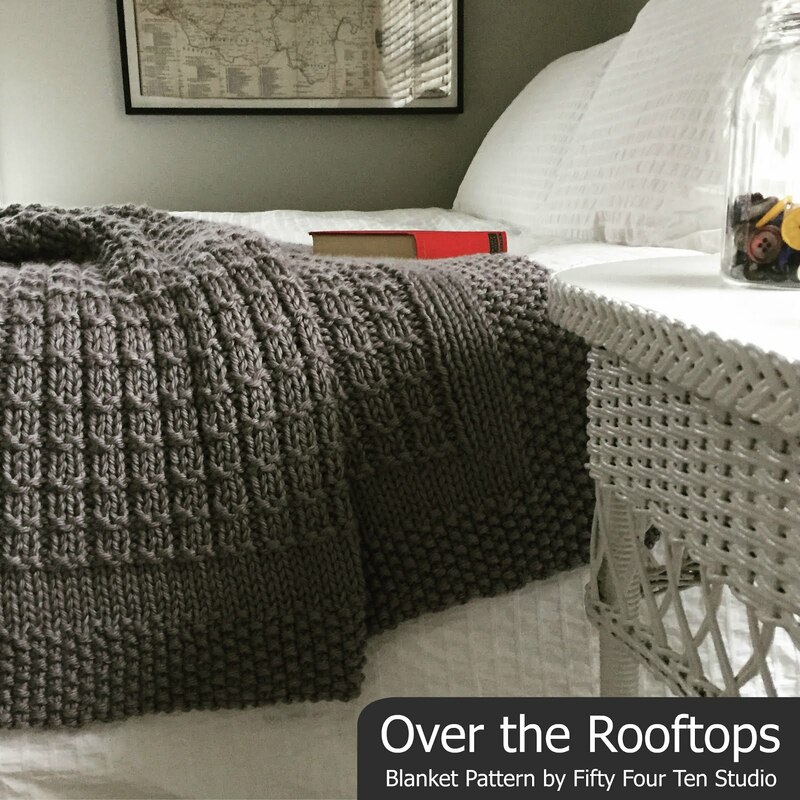 The pattern includes instructions for six blanket sizes. Read all the details below! Happy Endings blanket knitting pattern is available on Ravelry. The pattern is also available on Etsy and LoveKnitting. 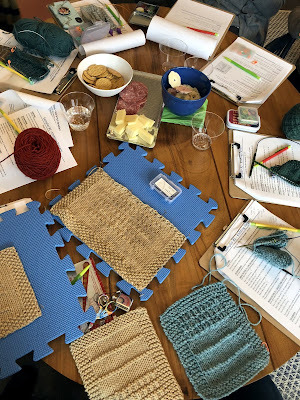 It means so much to see how knitters use my patterns...and to hear their stories of how they demonstrate their love for their family through their handmade gifts. 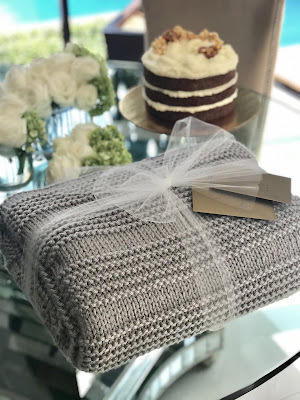 They often make blankets to celebrate happy beginnings...to welcome babies to their family, to give to adult children moving into their first apartment, to celebrate a wedding, and to celebrate a loved one's birthday. All of these gifts are heartfelt wishes for happiness. 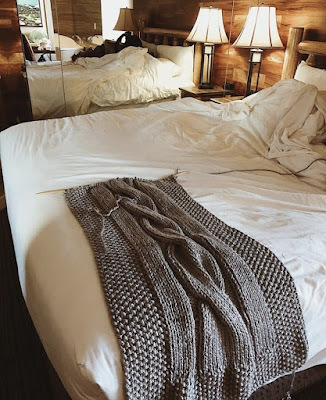 And, each day those blankets will give comfort and be a physical reminder of their love. Here's to celebrating happy beginnings...and wishing for happy endings. Happy Endings blanket knitting pattern - It's reversible! 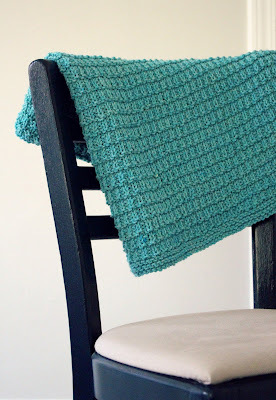 It's very easy to make any of the blanket sizes longer by adding additional pattern repeats. 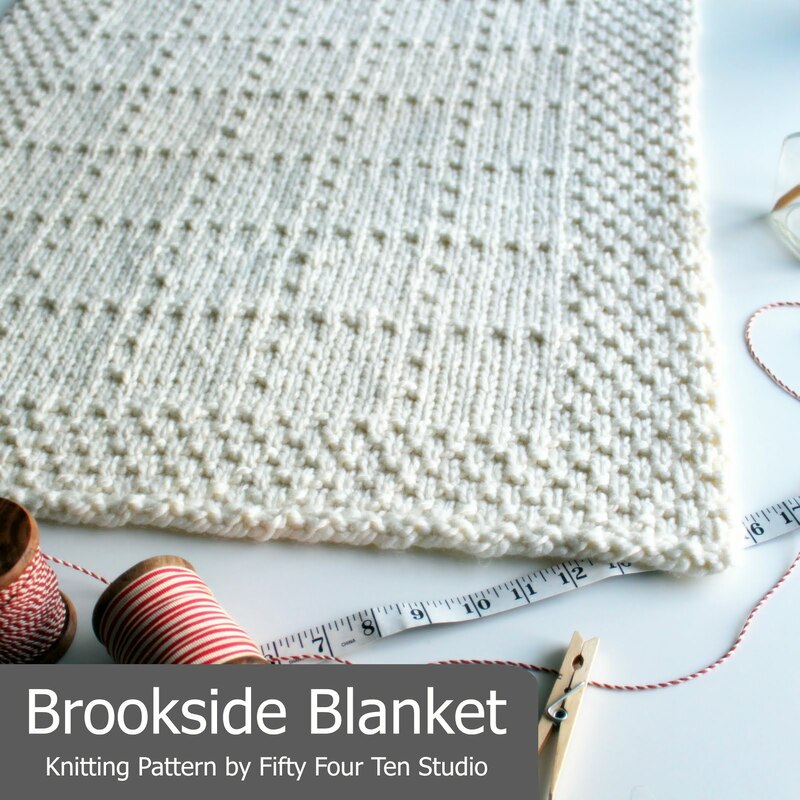 The pattern includes estimates of how much additional yarn is needed to make each blanket size longer. I made the small blanket size which is about 30" wide x 34" long. This blanket pattern looks attractive on both sides. Be sure to buy additional yarn if you plan to add length to your project. Estimates for additional yardage needed to make each size longer are noted in the pattern. This pattern may be used with slightly lighter weight yarns. Select the needle size that gives the best appearance for your yarn and knitting tension. To adapt for worsted or Aran weight yarn, follow the instructions for 2 or 3 sizes larger than you want the blanket to turn out. I used Lion Brand Yarn 'Color Made Easy' bulky weight yarn in the colorway 'Shade'. This bulky weight yarn has a lovely, light weight feel. This is my second blanket design with this yarn and I'm thrilled with the results. This yarn is 100% acrylic, easy care and affordably priced. And, it's available in more than 20 pretty colorways. The project is worked flat, back and forth on circular knitting needles. Circular knitting needles are necessary in order to accommodate the large number of stitches for a blanket. I used US size 10.5 knitting needles for my Happy Endings blanket. Pick the needle size that gives the best appearance for your yarn and knitting tension. The goal is to find the knitting needle that gives the best stitch appearance, without being too tight...or too loose. This is a very easy knitting project. The main section of the design is a two-row repeat stitch pattern. 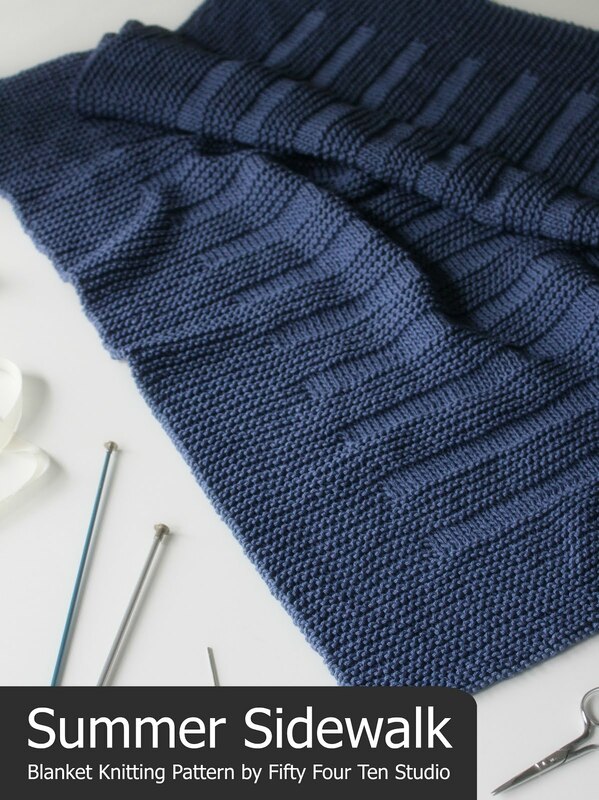 You will need to know how to cast on stitches, knit and purl confidently, change back and forth from knit to purl confidently, read a row by row knitting pattern, bind off stitches and weave in ends. Blocking of the finished blanket is suggested, but not essential for this pattern. Click here to see my blog post for tips and information about blocking a blanket. 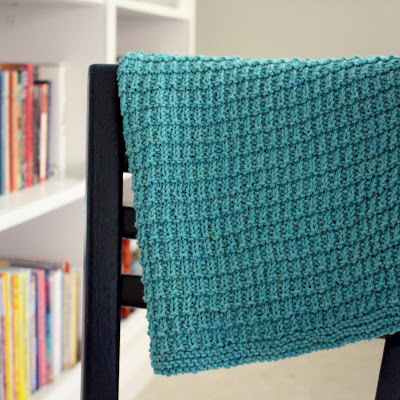 The 'Happy Endings' blanket is very easy to knit with bulky weight yarn. Thanks so much for stopping by and reading. Have a wonderful day! 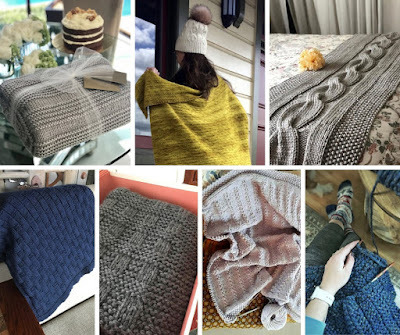 How Knitters Use Fifty Four Ten Studio Patterns - Sharing their projects! 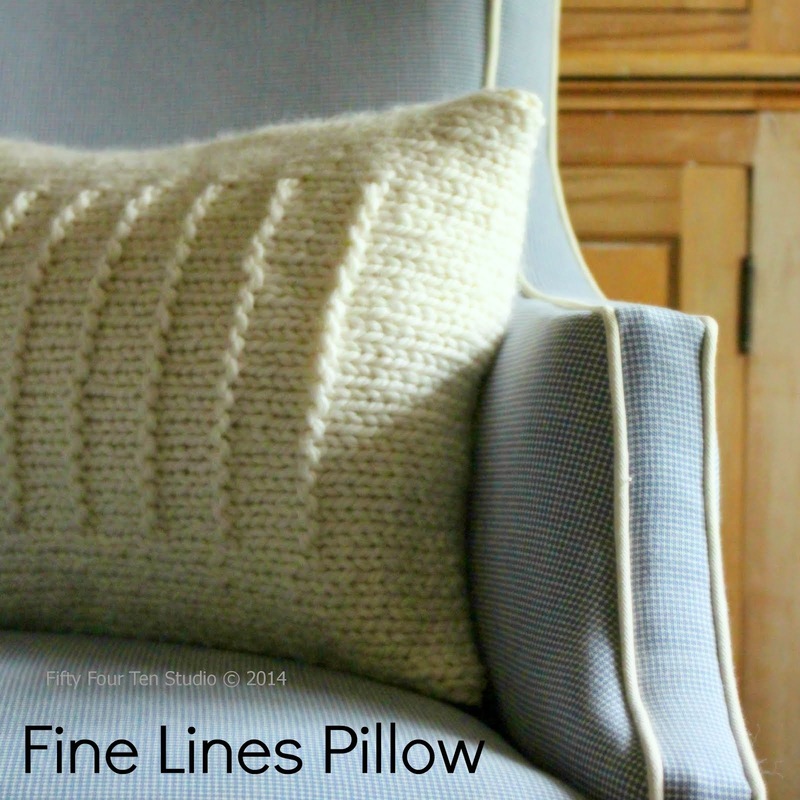 Today, I'm sharing photos of some projects customers have made using my Fifty Four Ten Studio knitting patterns. 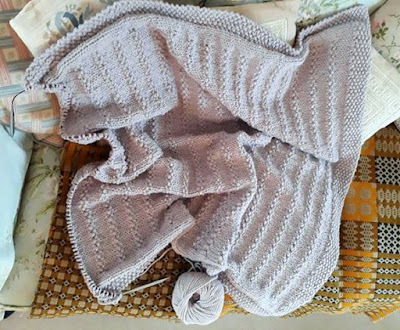 It's such a joy to see how knitters have used my patterns to make special items for their family and friends...as well as their own home. These are just a few of many lovely finished projects. All photos shared with the permission of each knitter. Click the links on each pattern name to read more about each pattern here on my blog. Patti has made several blankets using my knitting patterns. 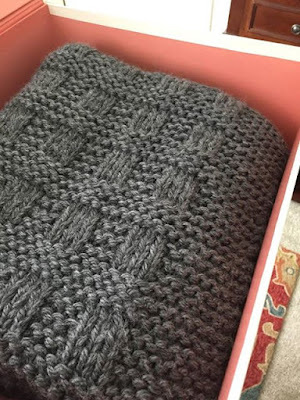 She sent me this photo of the Westport Blanket she made for a birthday gift...neatly folded and boxed up for gift giving. It looks absolutely lovely! Patti also made the Over the Rooftops blanket in this pretty pinkish cranberry shade. (I'm sorry I forgot to ask her the yarn color!) Beautiful stitches! 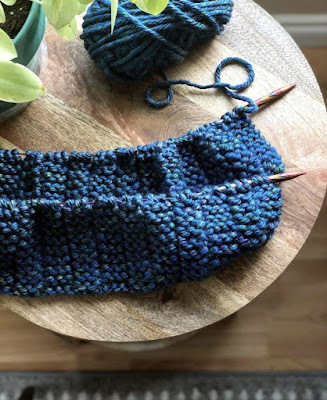 Khonnie is knitting a River of Dreams chunky cable bed runner blanket and has shared several gorgeous progress pics on her @atticus_fynch Instagram account. 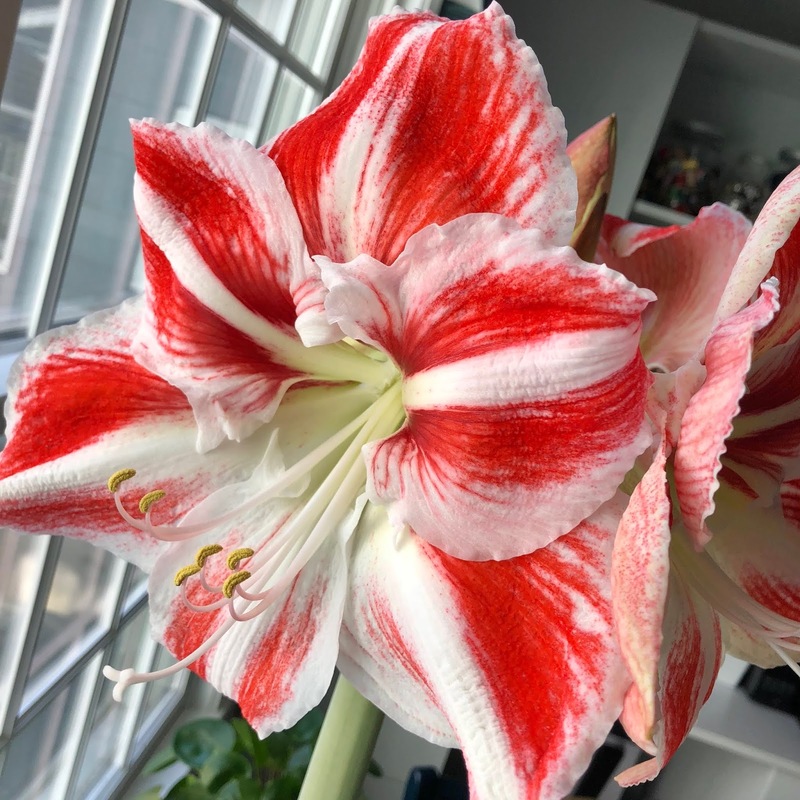 It was hard to pick just two photos to share! Her caption for this one: "I take my projects around so I can say they were made in different places. #madeinsac#madeintahoe #madeinLA"
How about the pretty composition of the photo below: the open window...the dark shadow in the foreground...the cable knitting appearing out of the shadow and drawing our eye to the window. Khonnie's caption: "Adding #madeinoakland to this cable bed runner. I’m renting a small room this weekend while finishing a weaving workshop in Oakland." 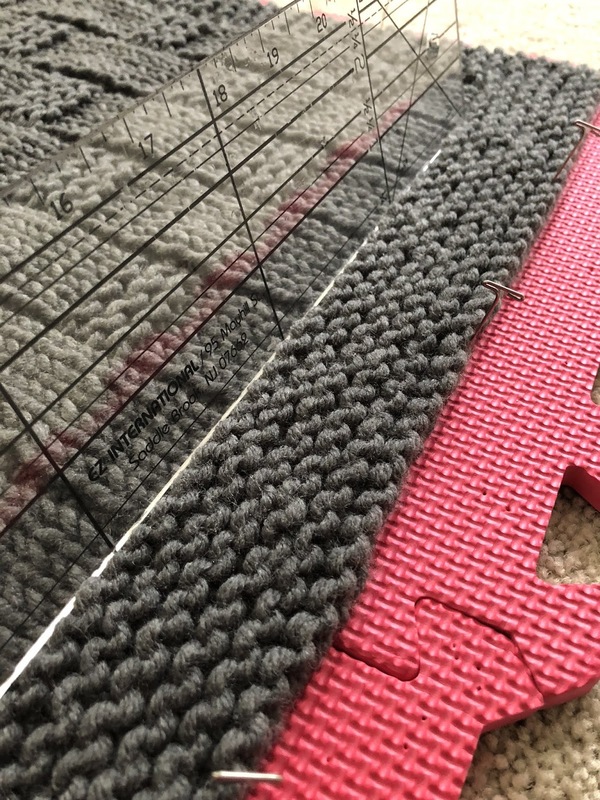 Head over to Khonnie's Instagram account to see her posts about weaving! Khonnie's finished 'River of Dreams' bed runner knitting project. Here's a work in progress photo of Eleri's Stones in the Road blanket. She used Drops Andes yarn in the 'Gray Lilac' colorway. I love how the chunky texture of her knitting looks with all the fabric designs on her couch...so cozy! And....she also made this beautiful Across the Diamond blanket for her parents last year. Such a special gift with perfect stitches...and a gorgeous yarn color! 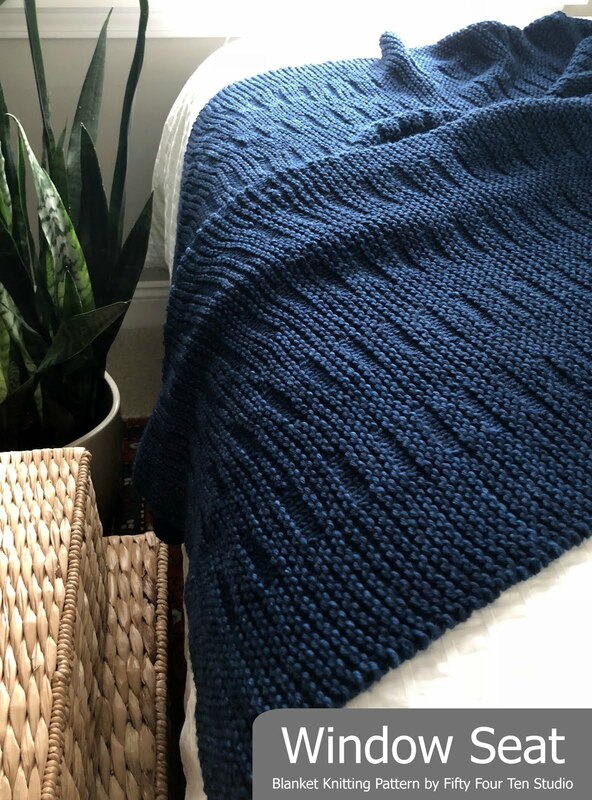 Carla knit the All These Places blanket in a lovely navy blue yarn. She told me the yarn is Kramer Yarns Perfection Chunky in the colorway 'Admiral'. 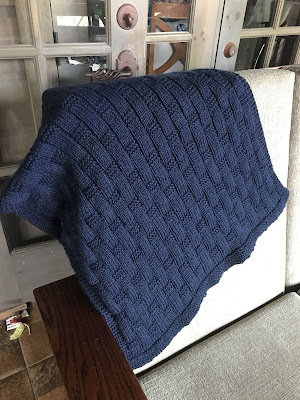 When I emailed Carla to ask if I could use her project photo for this blog post, she shared with me that this is her 10th finished knitting project...and she's only been knitting for about four months. 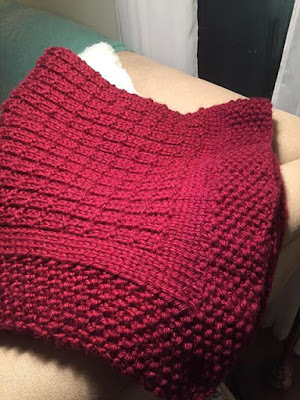 She started knitting in November 2018 and she made this blanket in March 2019....it looks fabulous! 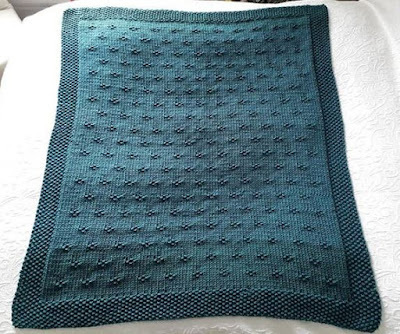 Carla, from Mexico, shared this lovely photo of the beautiful blanket she made as a birthday gift for her adult son. She used my Where the Sidewalk Ends knitting pattern and Lion Brand Hometown USA in the 'Dallas Grey' colorway. Her stitches are gorgeous! Such care and love shows in her presentation of flowers, cake and her handmade gift. 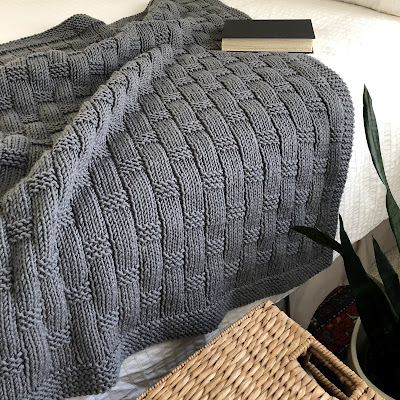 I love this September 2018 photo of Shona's finished Stay on the Ridge blanket! 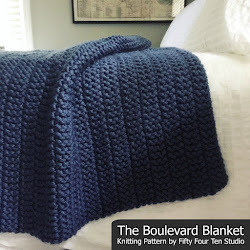 Liz used Lion Brand Hometown USA in 'Lake Tahoe Blue' for her Boulevard Blanket project...it's gorgeous! I love how the very subtle variegation of the yarn works with the stitch pattern. 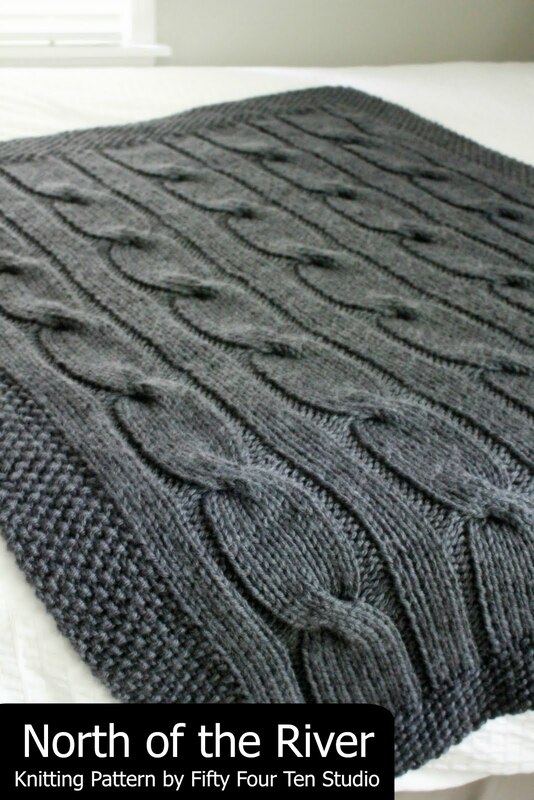 The Boulevard Blanket knitting pattern is *free* everyday on Ravelry and LoveKnitting. It's easy to knit with super bulky yarn. 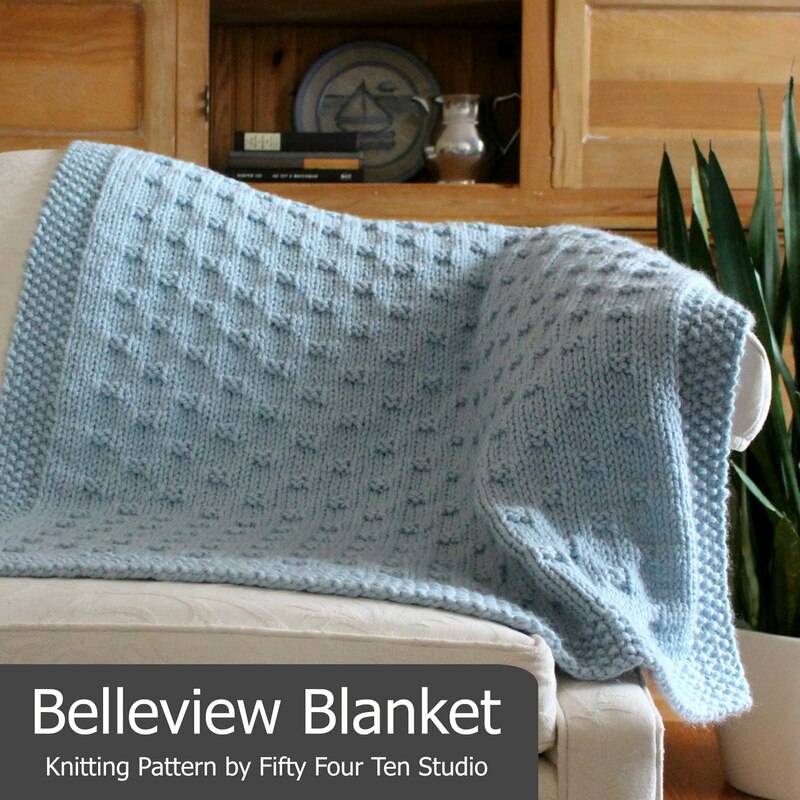 The pattern includes instructions for six blanket sizes! Thank you so much to Patti, Eleri, Carla, Khonnie, Liz, Shona and Carla (yes...two knitters named Carla!) for sharing their Fifty Four Ten Studio project photos....and for allowing me to share their beautiful photos with you here on my blog. 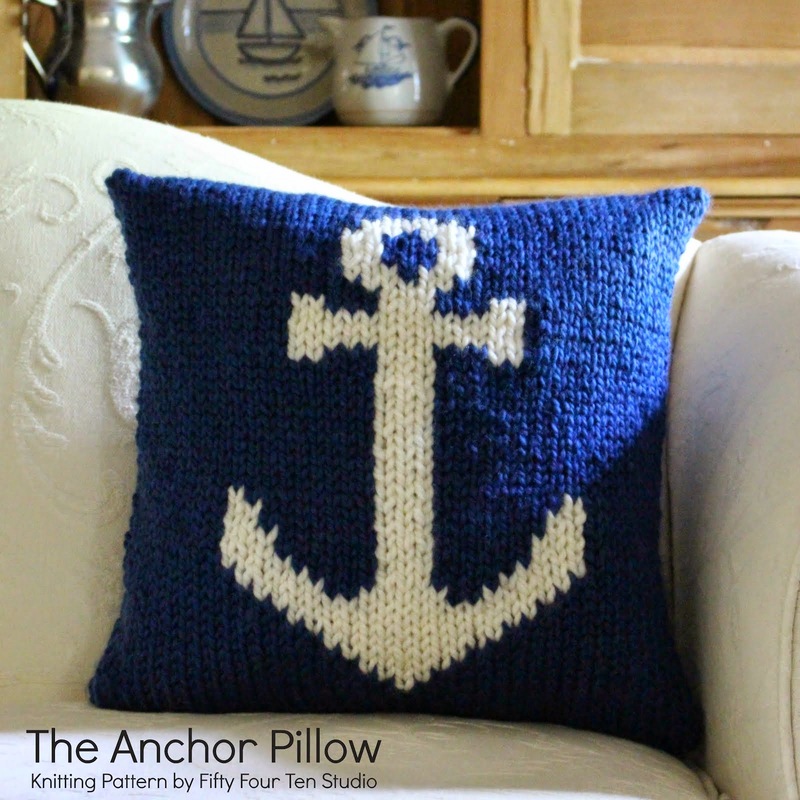 It's a joy to see how other knitters use my knitting patterns! Email: My email address is in all of my pattern documents...drop me a line anytime! I love hearing about your projects! 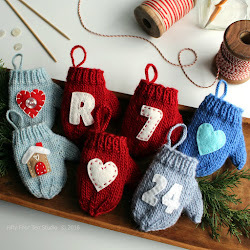 Ravelry Projects: I love seeing Fifty Four Ten Studio projects that are shared on Ravelry! I try to check on Ravelry and look for new projects every few weeks. Thanks so much for reading! Have a fabulous day! It's so fun to announce my new blanket knitting pattern - All These Places. All These Places blanket knitting pattern is designed for bulky weight yarn. I loved using Lion Brand Yarn 'Color Made Easy' bulky yarn in the colorway 'Basalt' for this project. More about the yarn below! All These Places blanket knitting pattern is available on Ravelry. The pattern is also available on Etsy and LoveKnitting. Lion Brand is offering a kit to make the All These Places blanket! The kit includes a printed pattern with instructions to make a large size blanket (41” wide x 48” long) and 5 skeins of Color Made Easy bulky weight yarn. Choose one of 4 colorways: Basalt (gray shown here), Shade (light icy gray), Alabaster (ivory) or Kombucha (chestnut brown). I love the colorways that Lion Brand selected for this kit! Click here to get more information and purchase the kit on the Lion Brand Yarn website. My grandparents' home...that inspired the name Fifty Four Ten Studio. The house number was 5410. They purchased the home when my mother was a girl. I was very young when they sold the house but the memories are preserved through photos of cousins dressed up and posing by the front door. My other grandparents' home...and the living room where we gathered and celebrated every Christmas Eve. Stores in Kansas City's Brookside neighborhood where I grew up...especially The Dime Store where we shopped frequently. I remember the wide selection of merchandise - toys, gifts, office supplies, greeting cards, seasonal decorations, household essentials, etc. - displayed floor to ceiling, the well-worn hardwood floors, the owner greeting us when we walked in the door, and buying our school supplies there every fall before the start of the school year. 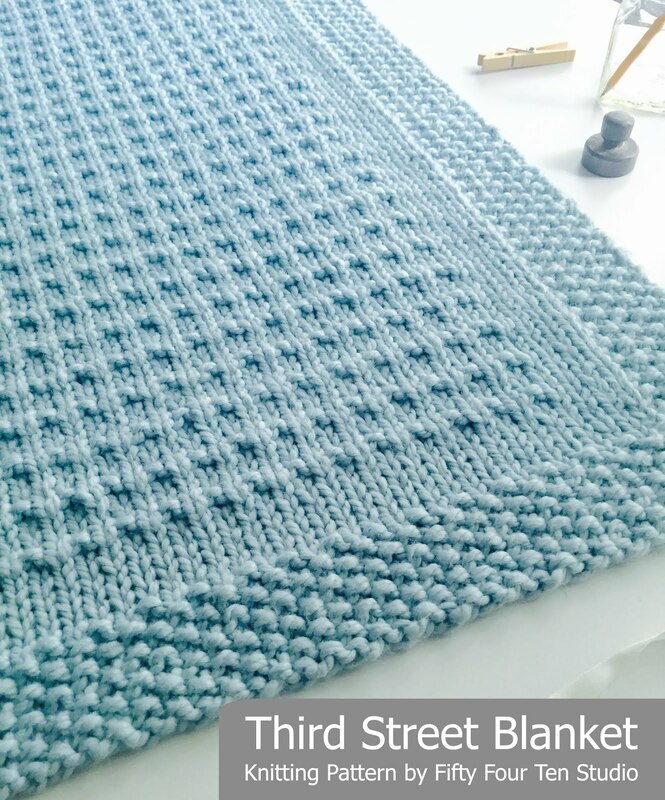 It's easy to make any of the blanket sizes longer by adding additional pattern repeats. Each pattern repeat adds about 4.5" to the length of the blanket. I made the Medium Throw which is about 34.5" wide x 44" long after blocking. All These Places - blanket knitting pattern for bulky weight yarn. Finished size and amount of yarn needed may vary depending on yarn choice and gauge...so buy some extra yarn just in case! All These Places blanket knitting pattern - work in progress. I used US size 10.5 knitting needles for my All These Places blanket. Pick the needle size that gives the best appearance for your yarn and knitting tension. The goal is to find the knitting needle that gives the best stitch appearance, without being too tight...or too loose. I highly recommend taking the time to block this blanket after weaving in the ends. 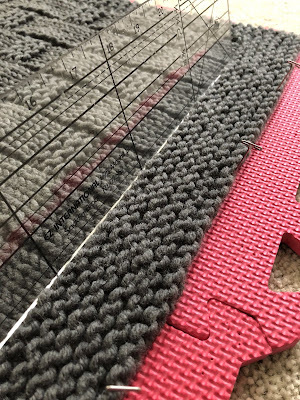 As you can see in the photos below, the stockinette stitch area between the garter stitch squares tends to pucker and look bumpy. The knitting also tends to gather in at the center a bit. Blocking removed all these issues! I made the medium size blanket which measured about 28" wide x 43" long before blocking. After blocking...the same blanket measures 34.5" wide x 44" long....the width changed by more than 6"! Click here to see my blog post with lots of tips on blocking your finished blanket project. Before blocking - center of blanket is bunched together. Before blocking - the garter stitch border does not lay flat. Recently, I've been using an old clear plastic quilting ruler to adjust stitches when blocking my projects. I use the edge of the ruler to push the stitches into a straight line. Using a quilting ruler to push stitches into a straight, even line. This is an easy knitting project for a confident knitter. The pattern is a 20 row repeat so it does require some attention to keep track of which row is being worked. It's not hard...just not as easy as some of my other patterns. 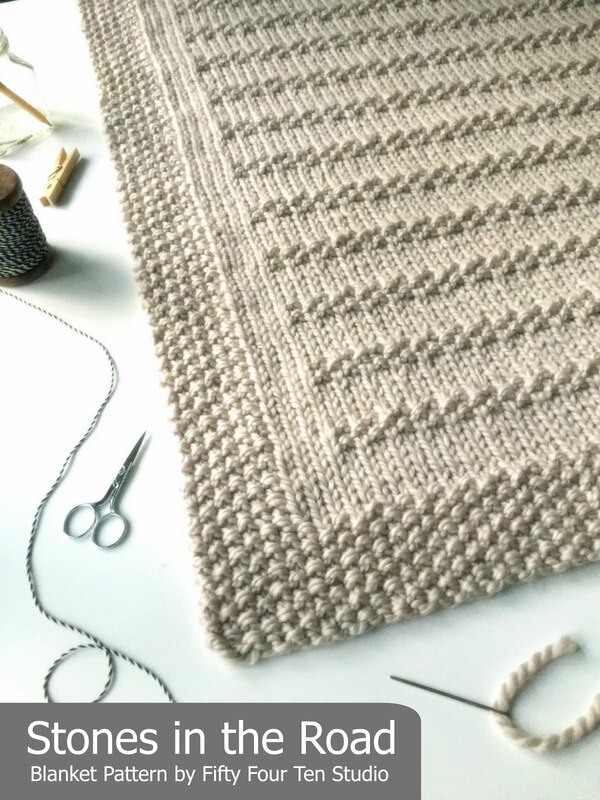 You will need to know how to cast on stitches, knit and purl confidently, change back and forth from knit to purl confidently, read a row by row knitting pattern, bind off stitches and weave in ends. It's also available on Etsy and LoveKnitting. As February comes to a close, we're anxiously awaiting signs of spring here in Kansas City. Spring flowers, watching Royals' baseball games, getting outside for an afternoon walk, knitting on the deck...all things to look forward to! Many Thanks to Two Darling Yarn Shops! 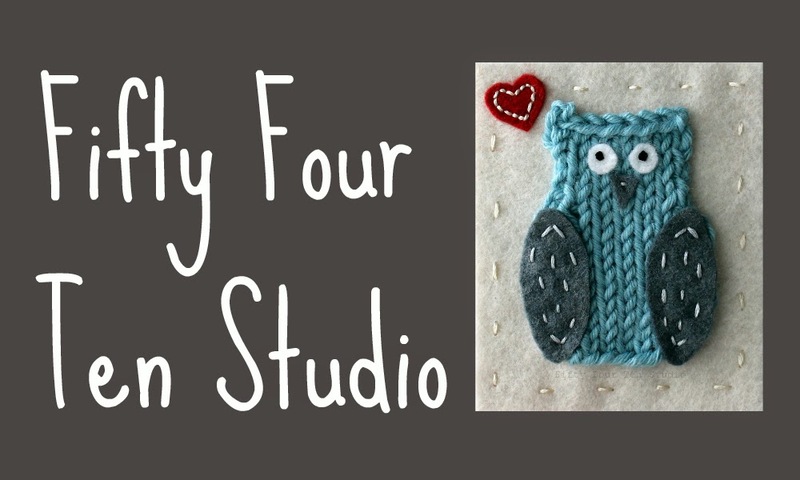 Many thanks to my friends at Yarn Social in Kansas City and Yarn Bar in Billings, Montana for helping make January such a fun month for me and my Fifty Four Ten Studio knitting design business. I can't thank them enough for their kindness and for recommending my knitting patterns to their customers. THANK YOU - YARN SOCIAL IN KANSAS CITY, MISSOURI! 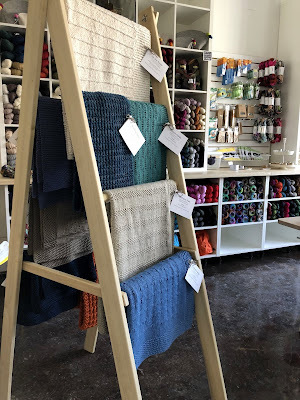 Yarn Social hosted a five day trunk show of about ten of my knitting pattern samples at their darling shop in Kansas City, Missouri. This was my first knitting trunk show and it was such an honor to be invited to display my samples at Kansas City's newest yarn shop! Fifty Four Ten Studio trunk show at Yarn Social in Kansas City, Missouri. Quality Time scarf and Prairie Fields blanket knitting pattern samples. Here's a photo of the knitting class in progress...sampler pattern instructions, pretty yarns, blocking demonstration and snacks! Knitting class at Yarn Social! The 'Toast' shade of yarn that I used for the examples of the sampler project (photo above) is Spud & Chloe 'Sweater' yarn from Blue Sky Fibers. I love how this yarn knits up! Great stitch definition and it blocks beautifully. Spud and Chloe 'Sweater' yarn in beautiful colorways at Yarn Social. 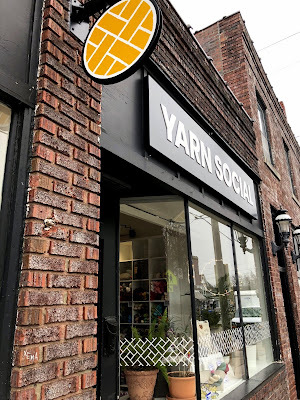 If you live in the Kansas City, or are visiting from out of town, be sure to make time to stop in at Yarn Social! Trish has a beautiful selection of yarns and she has created a warm and inviting shop. Yarn Social is located in the West Plaza / Westport area...near 45th & State Line Road. Check the Yarn Social website for hours! THANK YOU - YARN BAR IN BILLINGS, MONTANA! 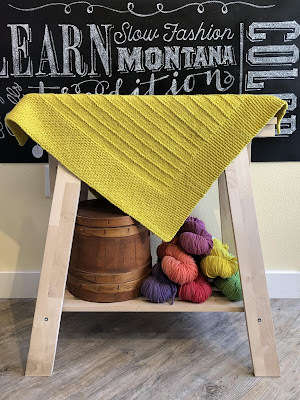 In January, Yarn Bar in Billings, Montana hosted a 'Cheers to Nifty Fifty Four Ten Studio KAL' - how fun is that?! 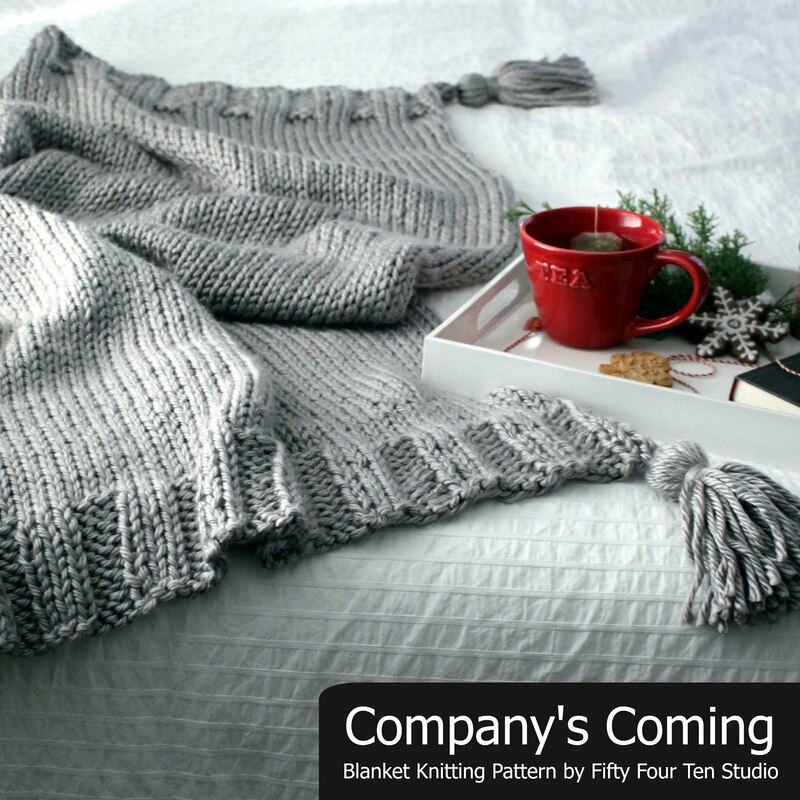 They suggested using any of my Fifty Four Ten Studio blanket or pillow knitting patterns as cozy winter project for the knit-a-long (KAL). 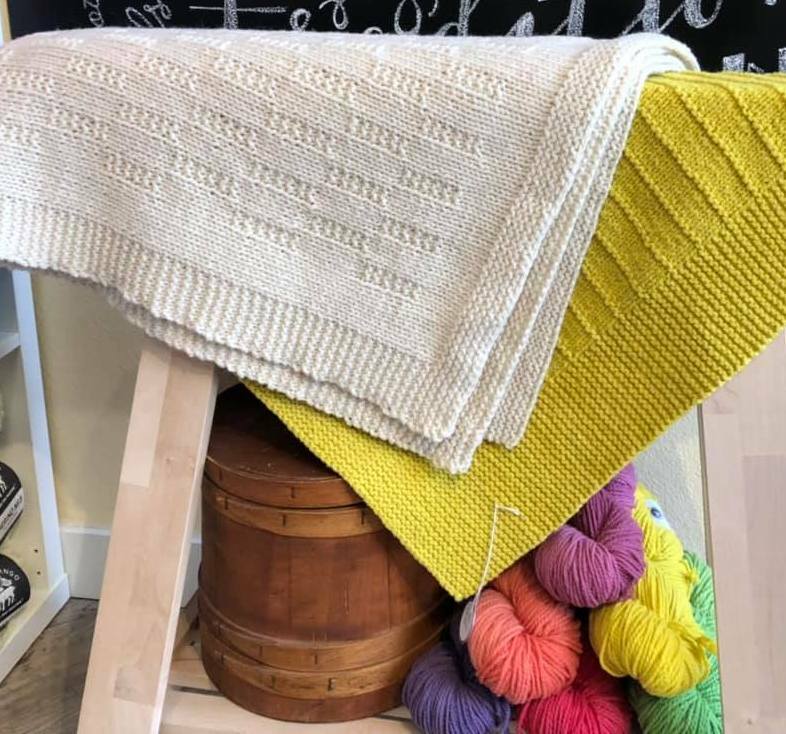 One of their customers finished a throw size Prairie Fields blanket! (Photo below.) I love that she used a beautiful ivory colored yarn so her stitches really shine! Lovely knitting and blocking. Prairie Fields blanket (ivory) made by a Yarn Bar customer! And, the yellow blanket...that's my On the Porch blanket design that Sue and Linda made up as a sample for their shop! They tell me the yarn is Cestari Sheep Mount Vernon in the colorway 'Daffodil'. This blanket is so cheery and full of sunshine! On the Porch blanket on display at the Yarn Bar in Billings, Montana. Our friend Teddy zipped in to knit a second one as soon as she got a request from the 'hipster' niece who had received the original one Teddy made, gets the 'where did you get that blanket' comment from fellow hipster parents, and wanted another one in different color. 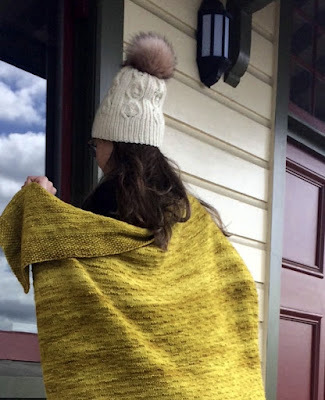 I'm so honored that Sue and Linda hosted this knit-a-long and that they have been recommending my patterns to their customers for a long time. One of these days I'm going to make it out to Billings, Montana to meet them in person!! I'm excited about other plans in the works for the coming months. There's lots happening behind the scenes...if only I could knit faster! Thank you so much for reading! Happy knitting! I'm so happy to announce my new blanket knitting pattern - Northern Trail. 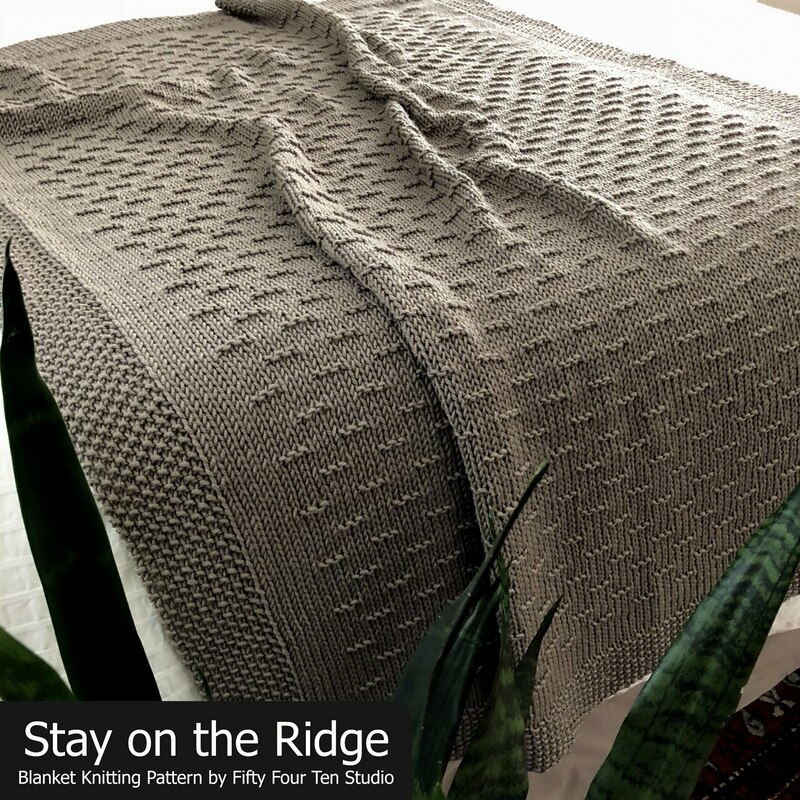 This blanket design features seed stitch 'stripes' on a stockinette stitch back drop. The blanket is framed by a seed stitch border. 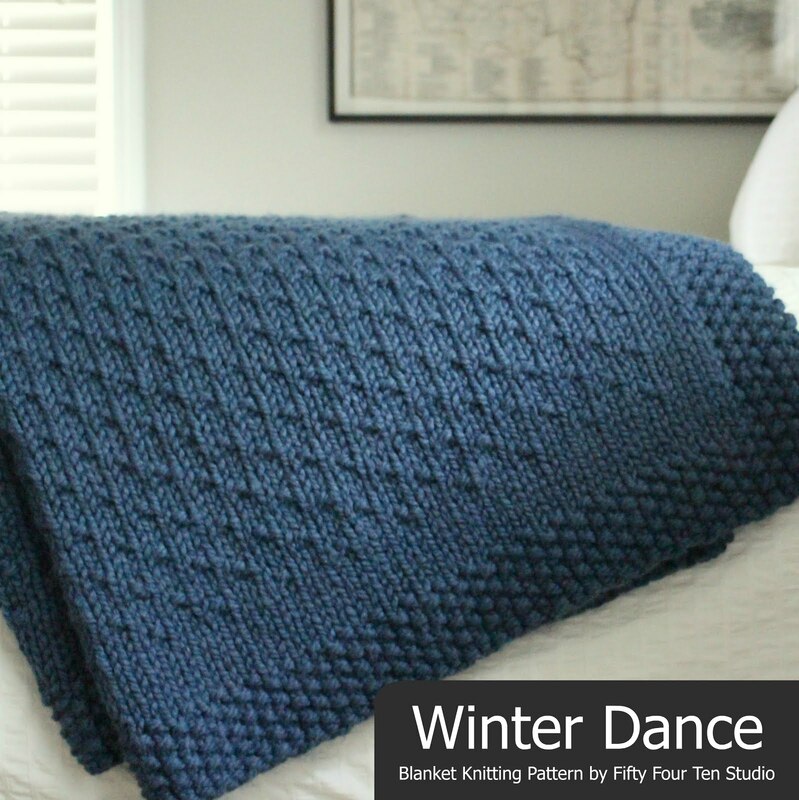 The pattern includes instructions for six blanket sizes. The Northern Trail blanket knitting pattern is available on Ravelry. Northern Trail blanket knitting pattern by Fifty Four Ten Studio. The name for my Northern Trail blanket pattern is inspired by memorable hikes through the woods...peaceful time to enjoy the beauty of nature and time with my family. Finished size may vary depending on yarn weight and gauge used. 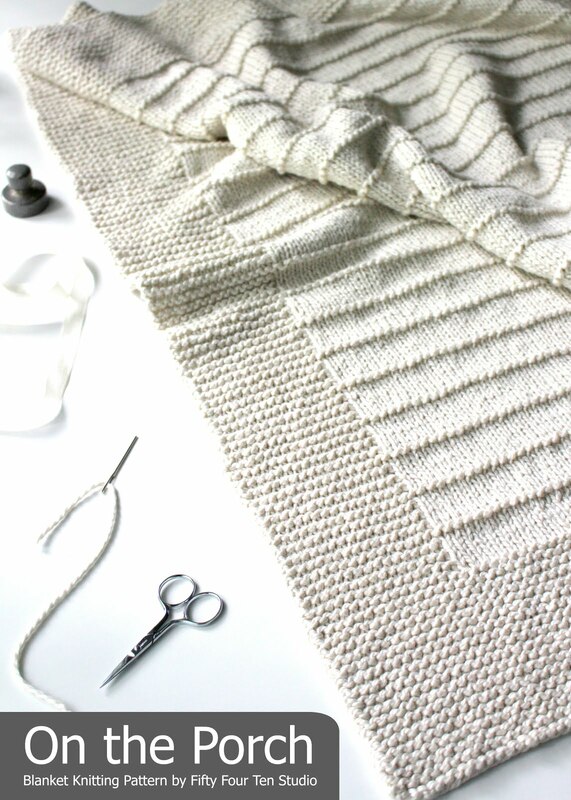 It's easy to make any of the blanket sizes longer by adding additional pattern repeats. Each pattern repeat adds about 2" to the length of the blanket. Working on my 'Northern Trail' blanket with Stonehedge Fiber Mill 'Shepherd's Wool'. The project is worked flat, back and forth on circular knitting needles. Circular knitting needles are highly recommended in order to accommodate the large number of stitches for a blanket. I used US size 8 knitting needles for my Northern Trail blanket. Pick the needle size that gives the best appearance for your yarn and knitting tension. The goal is to find the knitting needle that gives the best stitch appearance, without being too tight...or too loose. Four ring style stitch markers are helpful for keeping track of the pattern. Be sure to buy additional yarn if you plan to add length to your project. This pattern may be used with slightly lighter or heavier weight yarns. Select the needle size that gives the best appearance for your yarn and knitting tension. If you are using slightly lighter weight yarn, such as DK weight, consider following the directions for one size larger than you want the blanket to turn out. 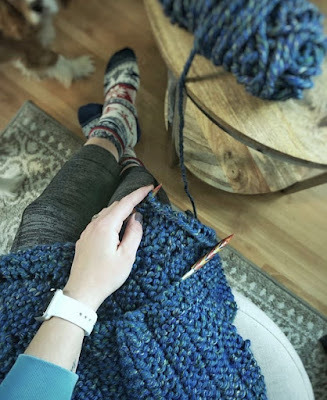 If you are using slightly heavier weight yarn, such as a heavy worsted or Aran weight yarn, consider following the directions for one size smaller than you want the blanket to turn out. If you prefer super bulky weight yarn please see my Stones in the Road blanket knitting pattern. Last summer I visited Stonehedge Fiber Mill in East Jordan, Michigan. It was such a treat to visit with the owners of this family run company. I purchased several skeins of Shepherd's Wool worsted weight yarn in the pretty color 'Beaches'. This yarn is lovely! I loved using this yarn for my Northern Trail blanket. It's a very nice quality wool...a vintage and traditional feel, wonderful stitch definition, and it's a pleasure to knit up. It's woolly...without being scratchy. I used Shepherd's Wool for a scarf project in 2017 and I just love it! 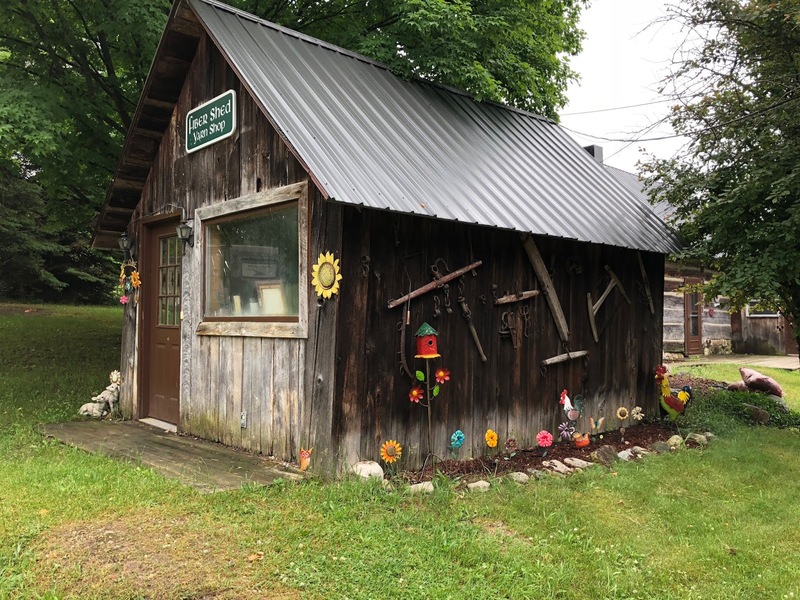 This is their tiny shop on their farm in East Jordan, Michigan. It was a pleasure to chat with the owner on a dreary summer day! Their yarn is also sold in many shops around the US, as well as Canada, Israel and Norway. 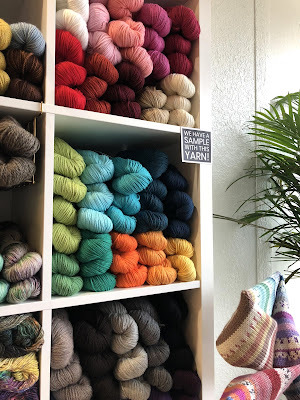 Click here to see their list of shops that carry their yarn. Stonehedge Fiber Mill yarn shop in East Jordan, Michigan. I highly recommend taking the time to block this blanket after weaving in the ends. 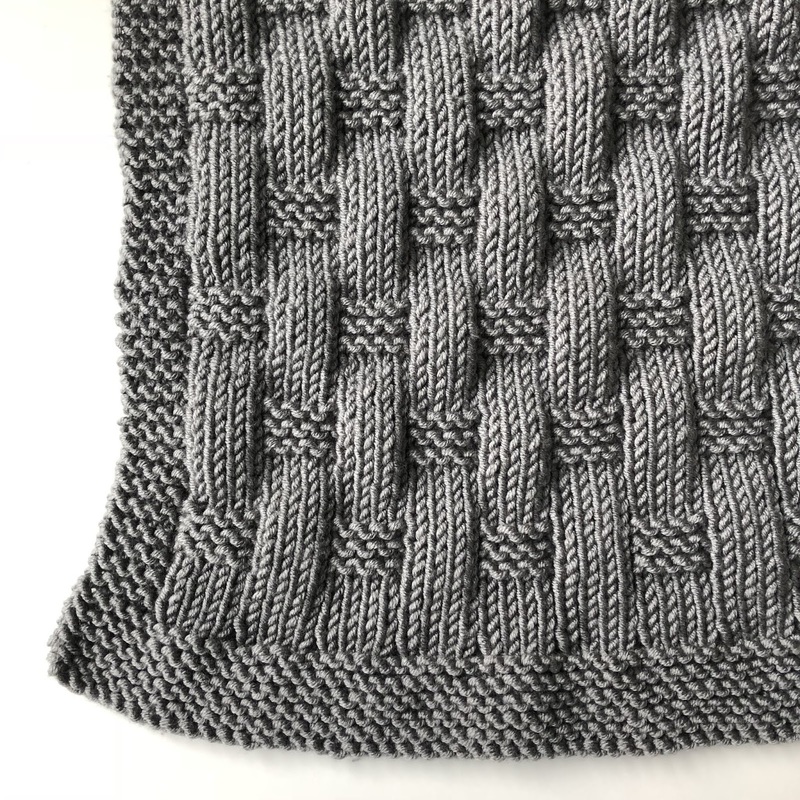 As you can see in the photo below, the stockinette stitch area between the 'seed stitch stripes' and the seed stitch border tends to pucker and look bumpy...and generally look unattractive. Blocking removed all these issues! Working on my 'Northern Trail' blanket knitting pattern. This is an easy knitting project for any knitter who has mastered knit and purl stitches, and changing back and forth from knit to purl. 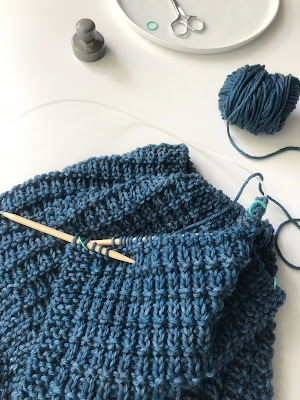 You will need to know how to cast on stitches, knit and purl confidently, read a row by row knitting pattern, bind off stitches and weave in ends. If you already know how to work seed stitch and stockinette stitch then you have the skills to work this pattern. Northern Trail blanket knitting pattern is available on Ravelry. I hope that you are able to have time today to do something you enjoy and that makes you happy. One of my goals for this year is to: "do more things that make you forget to check your phone." Knitting, reading books, spending time with family, going for a walk...these are always at the top of my list. And, this year I'm adding to the list to try some new recipes, go to the art museum (more than once a year!) and take walks through some beautiful spots in our city (when the weather warms up!). My friend gave me this beautiful amaryllis - the blooms were stunning! Before we get too far into the new year, I wanted to take a minute to say THANK YOU for your interest in my knitting designs, for purchasing my knitting patterns and for all your kind feedback. It means so much to me to hear that you have enjoyed using my patterns! 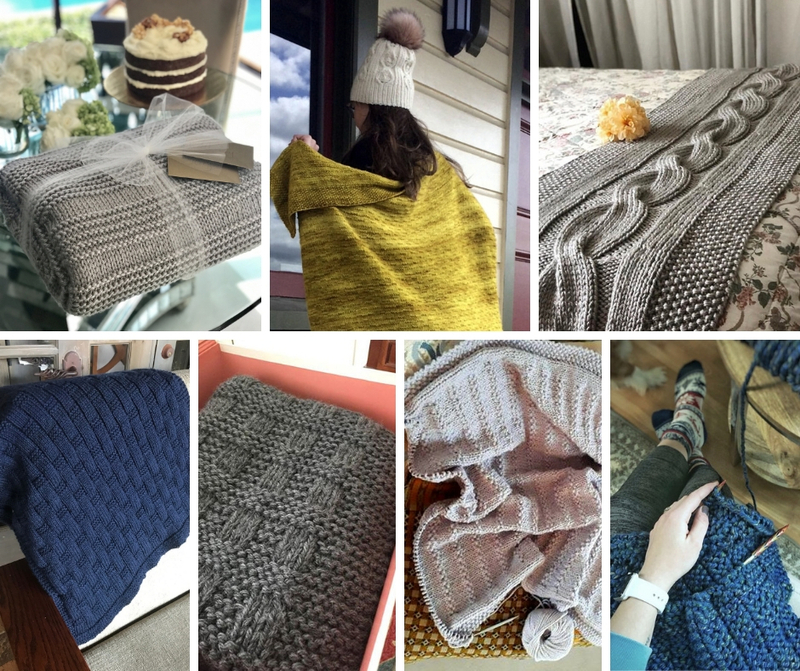 In November, I celebrated five years of designing and publishing knitting patterns. This past year was an outstanding and rewarding year for my little home based business...I appreciate your support so much!! Center Right: Plymouth Select yarn I used for my Stay on the Ridge blanket pattern. 1. My favorite project of 2018 is my River of Dreams bed runner blanket! I absolutely love how this project turned out! And...I love that knitters have really enjoyed using this pattern. 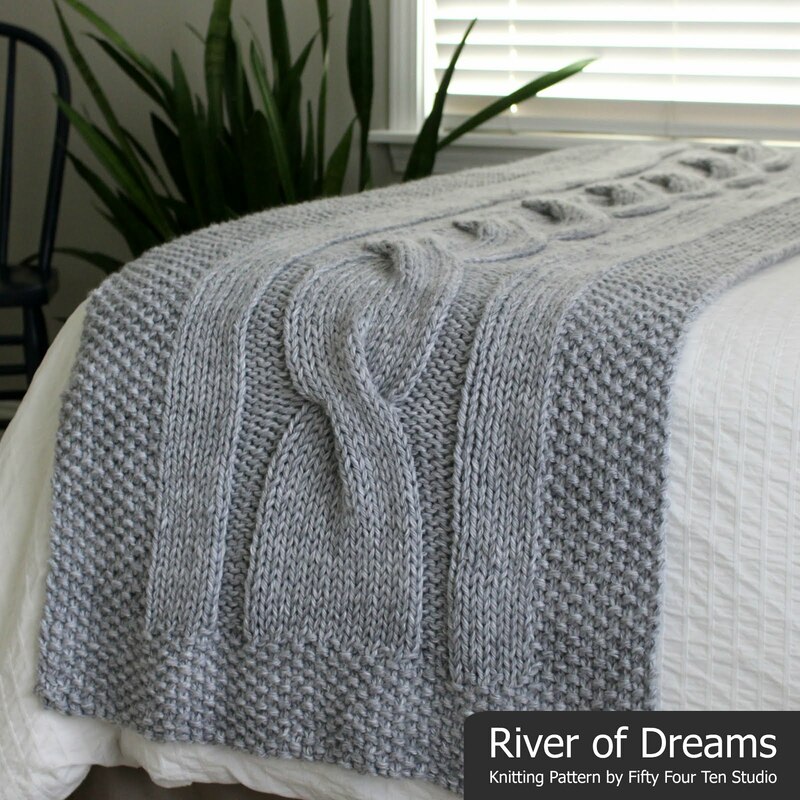 River of Dreams bed runner knitting pattern is available on Ravelry, Craftsy, LoveKnitting and Etsy. I used Lion Brand Hometown USA super bulky yarn for my River of Dreams bed runner. I picked the 'Springfield Silver' shade which looks great with the neutral color palette in our guest room. Lion Brand Hometown USA is very soft and very economically priced. The yarn is available in a wide range of colors. 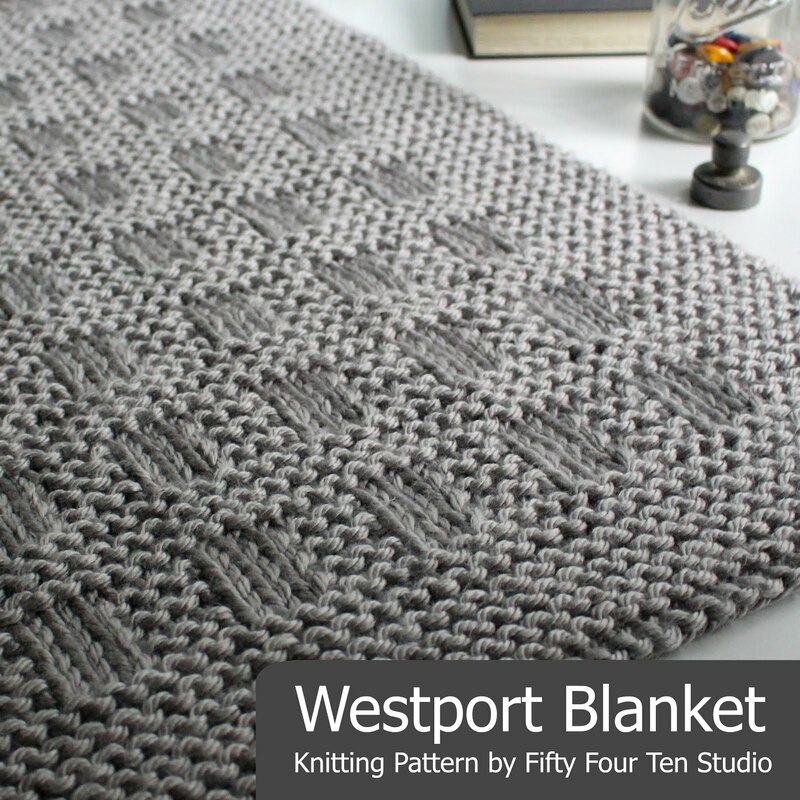 I especially love the neutrals such as 'Dallas Grey' (see it shown in my Westport Blanket knitting pattern), 'Chicago Charcoal' (see it shown in my North of the River blanket), and 'Houston Cream' (I'm working on a project with this right now!). Note that 'Springfield Silver' is one of the "print" or "tweed" colorways and comes in 64 yard skeins. Solid color Hometown USA skeins are 81 yards. Be sure to double check the yardage when purchasing. If you prefer a woolly texture and appearance...try Lion Brand Wool-Ease Thick & Quick. I've used it with many designs - such as my Game Time blanket below. Working on my River of Dreams bed runner blanket knitting design. 2. 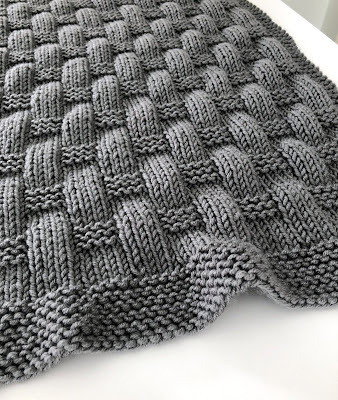 My second favorite pattern from 2018 is my Game Time blanket (and scarf) design. 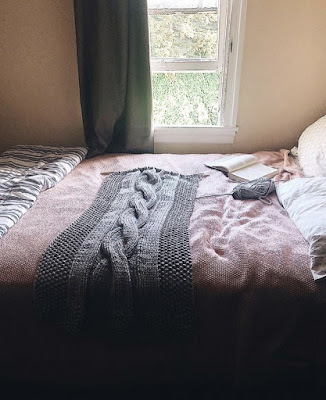 In late September, I decided I really wanted to make a fall inspired blanket and it called for branching out from my standard blue and gray color palette! I ordered 8 skeins of the 'Mustard' colorway of Lion Brand Wool-Ease Thick & Quick. The day the yarn arrived I cast on for this blanket...and I finished knitting the blanket within eight days! 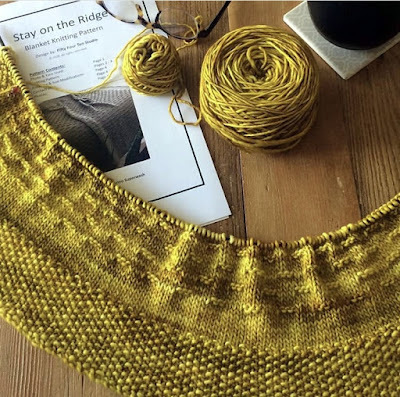 I enjoyed knitting outside on some beautiful fall days when the leaves were changing colors...matching my mustard yellow yarn. Game Time blanket knitting pattern. Game Time blanket & scarf knitting pattern is available on Ravelry, Etsy, Craftsy and LoveKnitting. This pattern uses an easy to remember four row repeat stitch pattern that gives great texture and is reversible! I made the medium size throw which is 41" wide x 45" long. 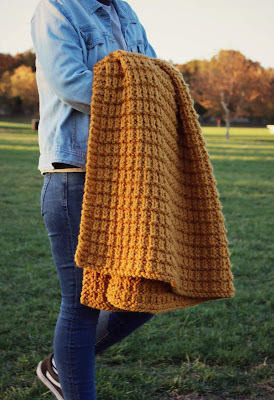 The pattern includes instructions for 6 blanket sizes...plus a scarf. This blanket is a favorite because I loved the experience of knitting it last fall, outside when the weather was beautiful, and I'm so pleased with how the color worked with the texture of the pattern. 3. 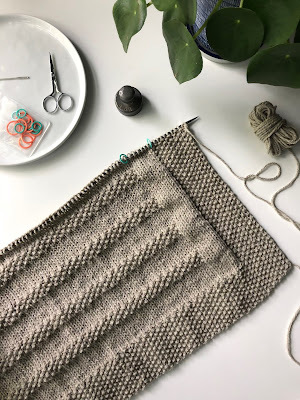 And...my third favorite pattern from 2019 is my Quality Time scarf (and blanket) knitting pattern. It's the worsted weight version of the Game Time blanket (above). 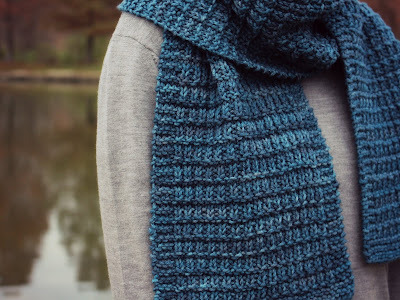 This pattern is a favorite because of the memories of the day I bought the yarn...and because I have worn this scarf on every cold day this winter! Quality Time scarf knitting pattern by Fifty Four Ten Studio. Quality Time blanket and scarf knitting pattern is available on Ravelry, Etsy, LoveKnitting and Craftsy. I used two skeins of Malabrigo Rios in 'Bobby Blue' which I bought at a cute shop in Fairfield, Iowa called At Home Store. They have a beautiful selection of kitchen, home and baby gifts...as well as a lovely selection of yarn! This scarf reminds me of one of my favorite days of 2018 when I got to spend some quality time with someone special. Working on a new blanket knitting pattern design. The yarn for this project is Lion Brand's new 'Color Made Easy' bulky weight yarn in the colorway 'Basalt'. I'm thrilled with the stitch definition of this yarn and I absolutely love the color. A really nice rich medium gray...a lovely neutral shade. To learn more about each of my patterns, visit my pages on Ravelry, LoveKnitting, Etsy and Craftsy (soon to be called Bluprint). I'm so excited to introduce my new easy to knit blanket and scarf knitting pattern for worsted weight yarn: Quality Time. The Quality Time knitting pattern has instructions for five blanket sizes...plus two scarf sizes! 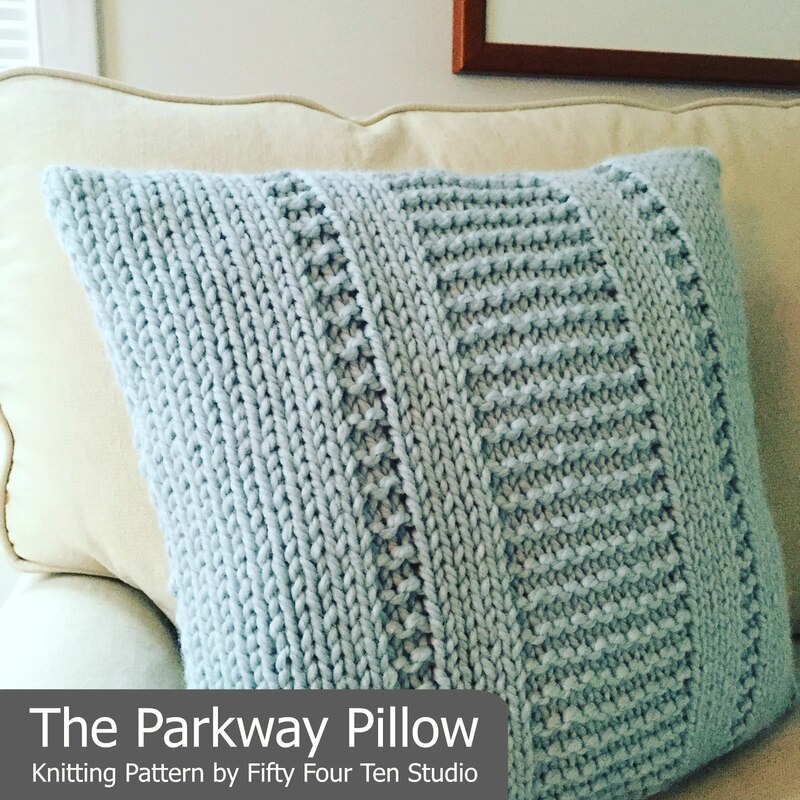 This design features a four row repeat pattern that is easy to knit. 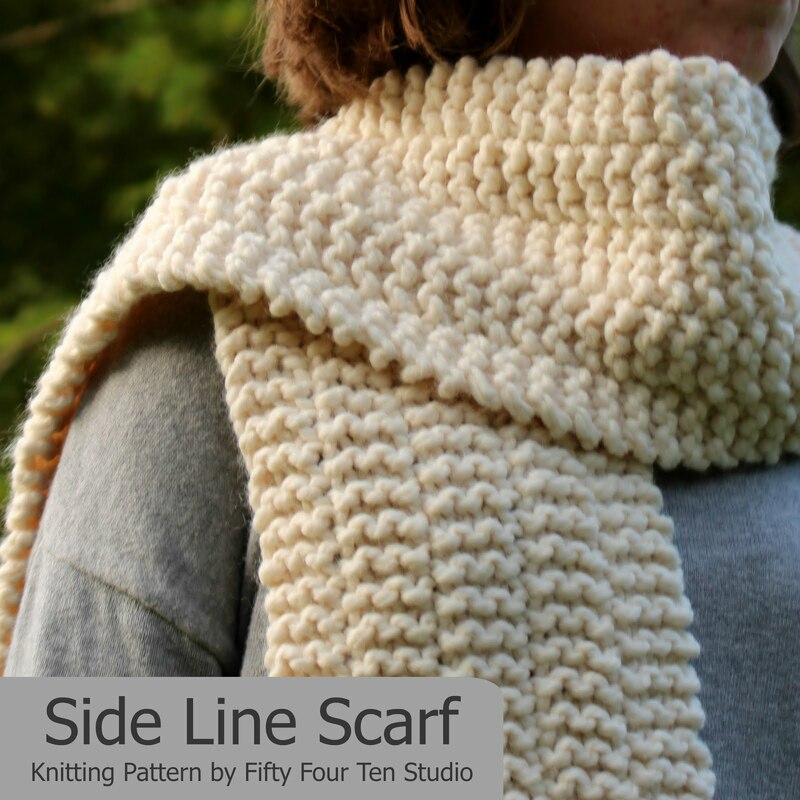 This is a great pattern for any level of knitter, including a confident beginner. For me, quality time includes time spent with my family, an afternoon enjoying a favorite hobby (knitting! ), an evening by the fire reading a good book or a morning walk with a good friend. Any day that has a bit of quality time worked into it is a good day! I made my scarf with two skeins of Malabrigo Rios in 'Bobby Blue'. I bought this yarn at a cute shop in Fairfield, Iowa called At Home Store. They have a beautiful selection of kitchen, home and baby gifts...as well as a lovely selection of yarn! This scarf will remind me of one of my favorite days of 2018 when I got to spend some quality time with someone special. 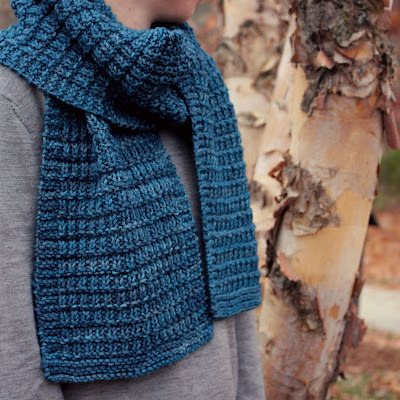 Quality Time scarf knitting pattern - it's reversible! The Quality Time knitting pattern design is reversible! The stitch pattern is almost exactly the same on both sides. The Quality Time knitting pattern includes instructions for five blanket sizes, plus two scarf sizes. 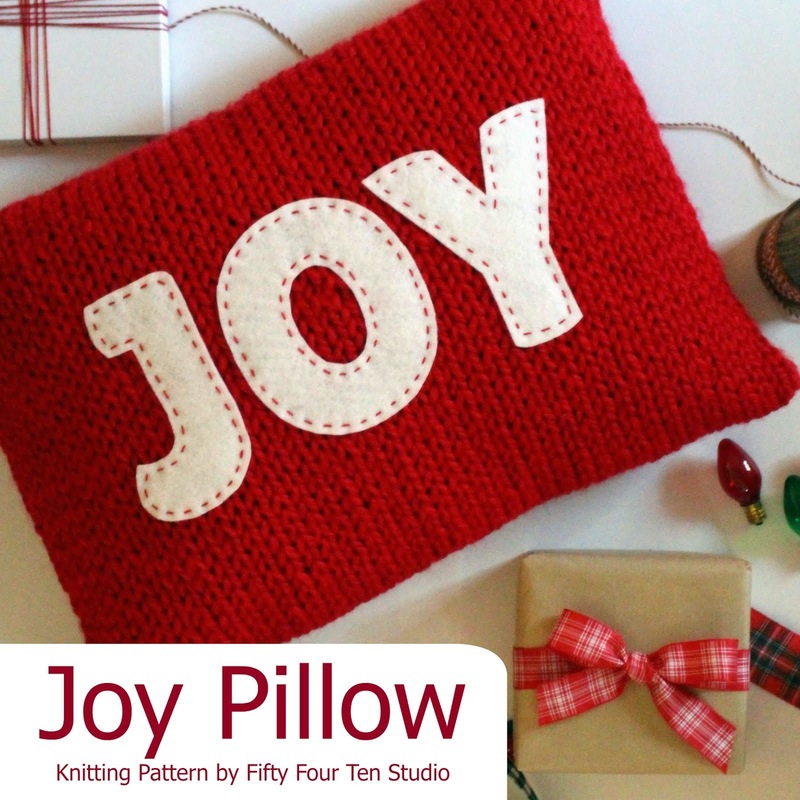 It is very easy to make any of the sizes longer by adding additional pattern repeats. Each pattern repeat adds about .5" to the length of the project. The pattern instructions include estimates of how much additional yarn is required to add length to each project size. This blanket pattern is designed for worsted weight yarn. 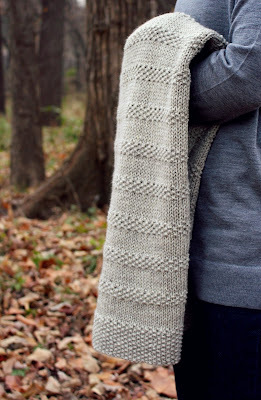 If you prefer super bulky weight yarn, please click here to see my Game Time knitting pattern. Solid color or a subtle variegated or hand dyed style yarn is recommended to show the stitch pattern best. For the scarf, shown in blue below, I used Malabrigo Rios in the colorway 'Bobby Blue'. This yarn is gorgeous! I used two skeins for a 8.75" wide x 63" long scarf. Knitting my 'Quality Time' scarf with Malabrigo Rios yarn. For the blanket, I used Shepherd's Wool Superwash Worsted from Stonehedge Fiber Mill. The colorway is 'Lakeshore'. I love how this blanket worked up in this pretty yarn. Great stitch definition! I used US size 9 knitting needles for my scarf and blanket. Pick the needle size that works best for your yarn and knitting tension. Circular knitting needles are recommended for knitting a blanket in order to accommodate the large number of stitches. Straight needles may be used for either scarf size. The Quality Time blanket and scarf is very easy to knit! 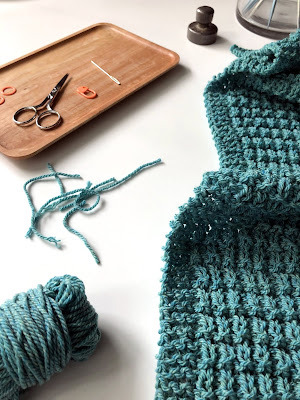 You will need to know how to cast on stitches, knit and purl confidently, read a row by row knitting pattern, bind off stitches and weave in ends. The two stitch techniques in this design are garter stitch and a K1, P1 repeat (like used for ribbing). A couple of stitch markers (ring and clip-on style) are helpful for keeping track of the pattern. I highly recommend blocking the finished blanket or scarf. It really improves the shape and appearance of the finished knitting! Click here to see my blog post with tips on blocking. I loved knitting the Quality Time blanket and scarf. Winter weather has arrived in Kansas City. I know I'll love wearing my new Quality Time many days this winter! Have a wonderful day! Happy knitting! I have been knitting, sewing and crafting since I was about eight years old. I love designing and writing knitting patterns! 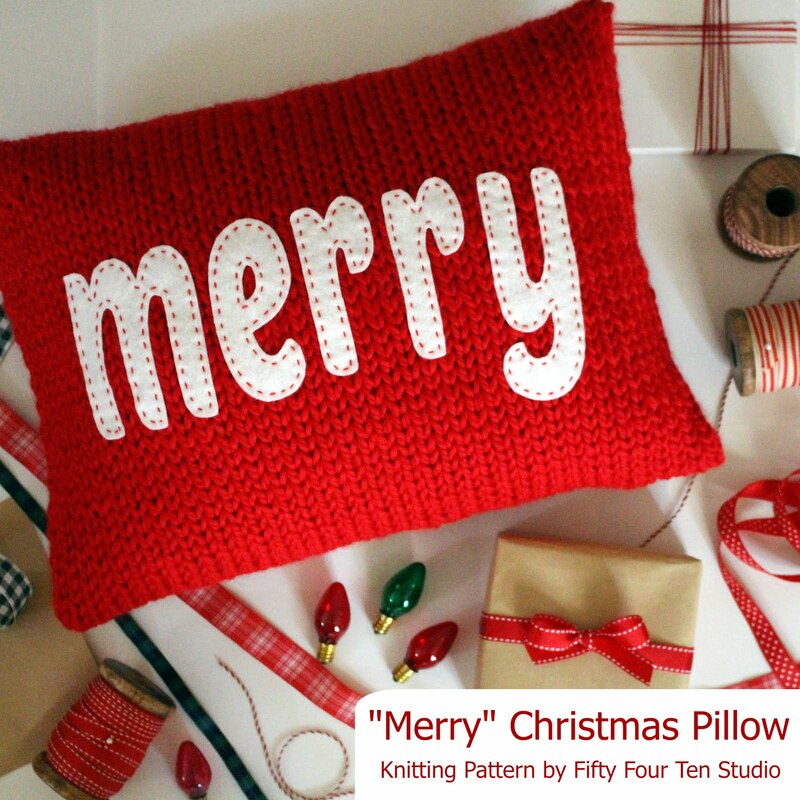 I hope you are inspired to use my patterns to knit special items for your home, friends and family. Fifty Four Ten Studio is named for the house number of the home my grandparents purchased when my mother was a young girl. Visit Fifty Four Ten Studio's profile on Pinterest. 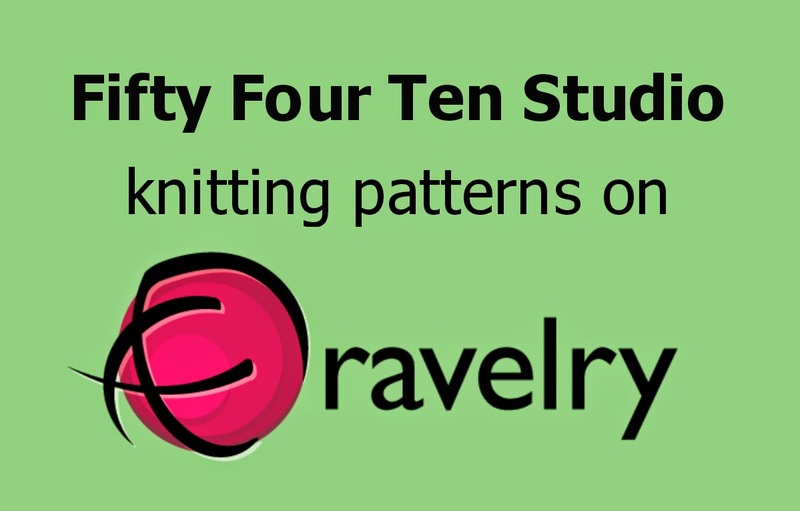 Fifty Four Ten Studio Ravelry Group - Click to Join! All content and photographs are the property of Fifty Four Ten Studio and may not be used without express permission. Patterns may not be resold, copied or redistributed for any reason via hard copy, e-mail or internet posting. Fifty Four Ten Studio. Simple theme. Powered by Blogger.